simpleTON [Freeware], Software Filter from whiteLABEL. simpleTON is a dual filter with distortion. Distortion with controls for drive, contour and mix. simpleTON [£10] - Available for download. A mono version of simpleTON is available for free (the full version is stereo). IK Multimedia T-RackS 3 Singles IK Multimedia has announced that users may now purchase and download T-RackS 3 Singles, individual processor plug-in modules from the T-RackS 3 Deluxe mastering and mixing suite. 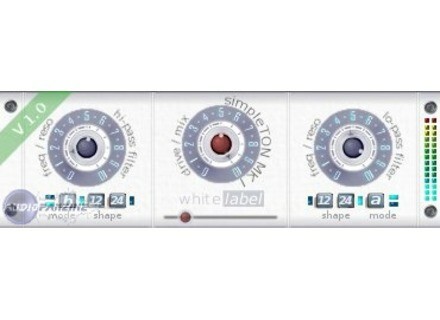 WhiteLABEL disPRESSA WhiteLABEL (Rough Diamond Productions) has announced the release of its new disPRESS plug-in for Windows. WhiteLABEL stwETCH stwETCH is a playable granular time-stretching / buffer repeater effect capable of stretching up to 500% normal length using granule sizes ranging from 10 to 500 ms.